According to a report from IBM tracking shopping trends for Thanksgiving and Black Friday (via Fortune), Apple devices dominated among mobile devices for online buying with 10 percent of shopping online done from an iPad. The device also dominated for online purchases originating from tablets, accounting for 88.3-percent of traffic. The iPhone came in at 8.7-percent of traffic for online purchases, while Android devices combined came in at just 5.5-percent. Apple appears to be testing a new “floating” Genius Bar design in a couple of retail stores. 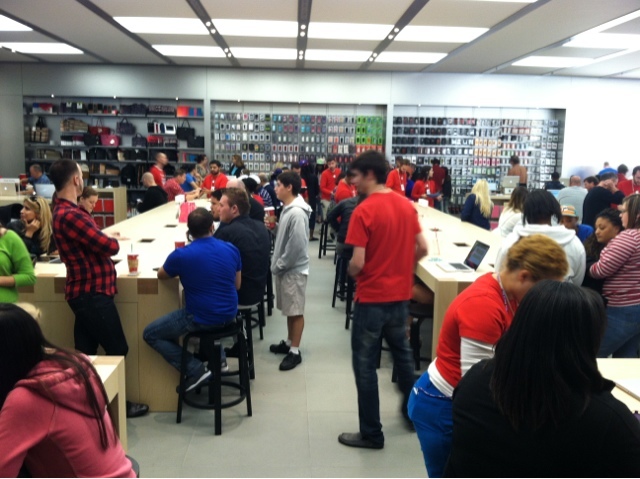 We originally saw images of the new communal Genius Bar configuration in July. However, today, TheDailyCity reported Apple is now testing the design in at least two stores: one in Orlando at Mall at Millenia and another in a Philadelphia Apple Store. Apple will apparently roll out the design to its Florida Mall store. Apple appears to like the new design, so we wouldn’t be surprised to see it in more Apple Stores in the near future. Apple and Samsung are now both seeking to extend their patent infringement claims in the California-based lawsuit filed in August. Samsung asked the courts in a filing last week to add the iPad mini and new iPod touch to the case after recently adding the iPhone 5. Now, FossPatents reported that Apple, as of Black Friday, sought to add six new Samsung products, including: Samsung Galaxy S III, Galaxy Note II, Galaxy Tab 8.9 Wi-Fi, Galaxy Tab 10.1, Samsung Rugby Pro, and the Galaxy S III Mini. The case isn’t scheduled to go to trial until March 2014. ‘We have our own sensor and a better flash. You dock you phone into our device and it turns you smartphone into a genius-phone. We take over the camera.’… The camera will be the first of a series of digital products that bear his name – to support them, he has invested in what he calls ‘digital real estate’ online. He now owns the domain www.i.am. Users of i.am+ accessories will be given individual online profiles, for example www.i.am/Will. Apple switched battery suppliers for iPad and MacBooks from Samsung SDI to Amperex Technology Limited and Tianjin Lishen Battery, according to a report from China Business News (via TechCrunch). Recent reports about processor price hikes, and Samsung dropping out as an Apple display supplier, were later denied by the company, so we’ll wait for official word regarding the batteries. The majority of iPad mini displays are coming from LG, according to a report from Digitimes. We already knew LG Display, AU Optronics, and Samsung are supplying display components for the device, but the sometimes-unreliable Digitimes claimed this weekend that the majority of displays are coming from LG—not AUO.